Because at Lovie we operate our own extensive, modern fleet of vehicles we have full control over our deliveries therefore eliminating the sometimes, unreliable third party haulage contractor. 30 tonne - flat bed trailers, low loader, bulk tippers, powder tankers. 6m3, 8m3 and 7m3 c/w 11 metre placement conveyor. Most of our vehicles can be provided with off-loading facilities in the form of a truck mounted forklift. This very versatile piece of equipment arrives "piggyback" on the rear of the lorry then dismounts on site, enabling us to distribute materials on site as required. 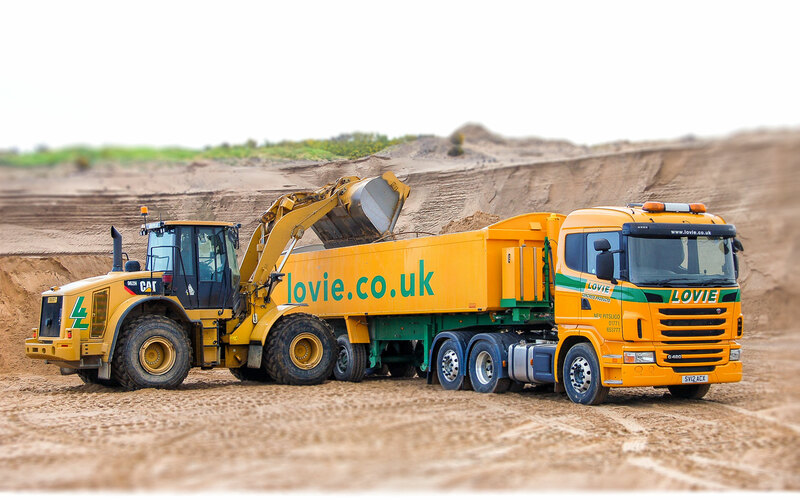 At Lovie we also pride ourselves on our ability to provide mixed loads within the one delivery. These can consist of products such as blocks, precast, cement, sand, crushed rock, bags plus many other items, therefore eliminating the need to arrange and receive multiple loads from sometimes numerous suppliers. We also operate a fleet of truck mixers for the delivery of ready-mix concrete from our plants in Aberdeenshire. These are available with 6m3 or 8m3 capacity and also one with 7m3 capacity complete with a 11 metre telescopic placement conveyor. Apart from delivery of our own products, all our vehicles are available for hire.